'Lilovy Tanets' Лиловый танец (Viacheslav Gavrilin, R. 2005). Seedling #(H-1)3-21-99. IB, 22" (55 cm), Early midseason bloom. 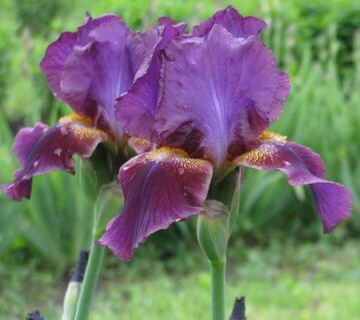 Standards dark violet-lilac; style arms lilac, serrated; falls dark violet-lilac, white haft marks; beards white, light yellow in throat; ruffled. 'Flumadiddle' X unknown). Podoliye 2006.